If you know that your non – lean habits aren’t bringing the best possible results to you and your endeavours, why cling on to them? Habits don’t only affect performance and productivity, but also your happiness. We will give some examples of this soon. If you truly value efficiency, you would do anything (yes, anything) that it takes to break your non-lean habits. After all, it’s all for the best, right? Sure, it won’t be easy. Habits that are deeply ingrained are quite difficult to break. However, it is possible and putting in the effort goes a long way. Of all the times during the day that you check and browse through your phone, how many of those events were actually useful, meaningful and productive? Be honest here. If you are checking your phone passively and failing to use it for work-related purposes, it is time you took control and decreased your phone use. After all, constant phone checking has been linked to increased problems. So what looks like a small, innocent habit may be creating damaging effects in the long run. Your home life affects your work life and vice versa. No doubt about it. Though it is possible to draw a physical line distinguishing between the two environments, some influence is bound to remain and crossover. Consider this article on lean manager’s homes. Having order at home makes your life easier, which makes it easier to prepare before work or settle in to relax after work. It may seem that sitting on your desk all day immobilised is a recipe for productivity. But, really, sitting harms the body and lowers your levels of concentration and alertness. So, to keep your mind and body invigorated, occasionally stand up and move around. Stretch. Your alertness be higher throughout the day, enabling you to be more insightful and observant of your work, surroundings, and operations. Having a higher position as the team manager doesn’t give you the right to overlook and disregard the suggestions of those “lower” than you. In fact, it is your duty to frequently and thoroughly consider any suggestions coming in from the workforce and use scientific management to determine whether the idea is good or not. Listening to your team, testing out their suggestions within specific sectors of the company and deciding whether the process should be automatised to the entire company is a classic tenet of lean management introduced in 1911 by Frederick Winslow Taylor in his work Principles of Scientific Management. Interestingly enough, Shigeo Shingo, the leading industrial engineer behind Toyota’s manufacturing operations, has been noted as saying he found Taylor’s Principles of Scientific Management to be incredibly inspiring. Non-lean habits can creep up at you from multiple directions and impact you on both interpersonal and intrapersonal levels. What we have covered are common areas for improvement that you can immediately begin working on and see impactful results. Thanks to the advent of smartphones, there is a constant risk of being distracted and losing focus. However, being aware of the repercussions is the beginning of change. And, remember: non-lean habits can exist outside of the workplace (such as at home) and then influence your performance on-site. You really need to assess each little nook and cranny of your life in order to identify where those non-lean habits are hiding and lurking. Lastly, always keep an ear open and listen to your team. You never know when the next great suggestion may pop-up unannounced. 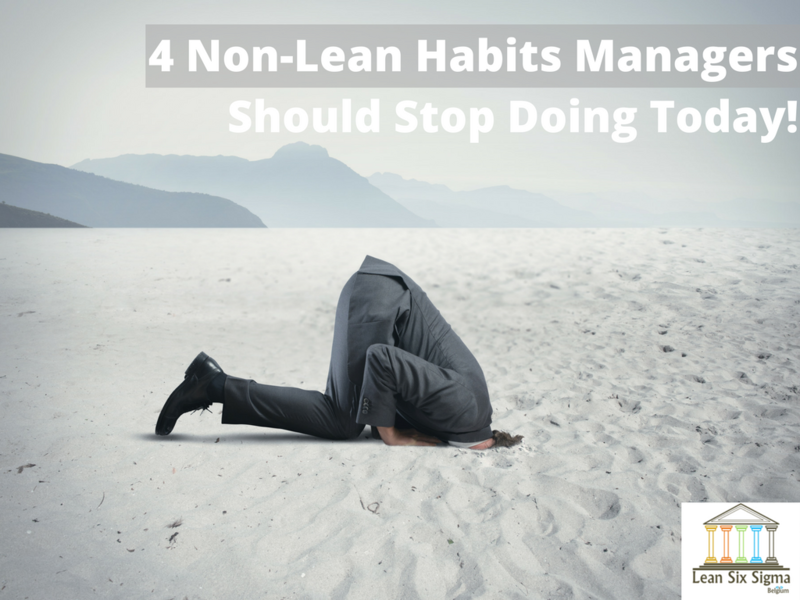 Non-lean habits exist everywhere, but they can be stopped. Luckily, change is a natural part of life that can be embraced as soon as you decide that that’s what you want. If you enjoyed this post, we would be very grateful if you’d help it spread by emailing it to a friend or sharing it on Twitter or Facebook.